MobileNotifier is one of the best takes on a new notification system ever created by a 3rd party developer. It is so well designed many believe its developer Peter Hajas was offered a job working for Apple on re-designing the next iOS notification system. While we told you Peter Hajas was taking a break from the development of the tweak he has surprised the community by releasing one last update for it under his supervision. – MobileReply. Reply to text messages while within other applications! It works like magic! – Full message text! Read everything in the alert, not just the first few words. – Redesigned minimalist alert display! – A brand new AlertDashboard, inspired by our amazing lockscreen view! – Dismiss alerts right from the popup! Hate going into the dashboard to remove alerts you’ve just archived? Simply hit the “X” in the popup to dismiss them for good! – Recall the most recent alert easily with an Activator action. Then use MobileReply to reply to it! – Thanks to work by Marc Easen, MobileNotifier now supports calendar invitation alerts! – Did I mention way way faster? An interesting app was released into Cydia today called TUI Checkpoint. The tweak, as the title of this post explains, will prevent drunk texting. This app works by first locking the messages app through the tweak and then asking you to pass three drunk tests which tests your reflexes and your psyc state. If you fail any of the three tests 3 times, you have to take the test again after an hour. It also comes with numerous configurable settings. For instance you can set emergency contacts such as the Designated Driver. When Messages is locked you can only text the emergency contact. You can also read the last 20 messages from the last 7 phone numbers. 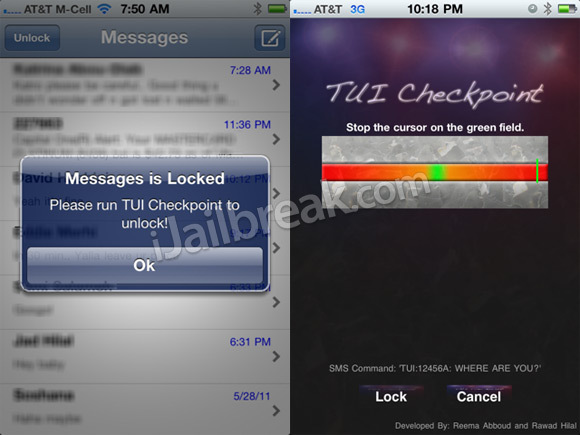 If you are interested in the TUI Checkpoint app you can find it through the Cydia Store for a price of $1.99! 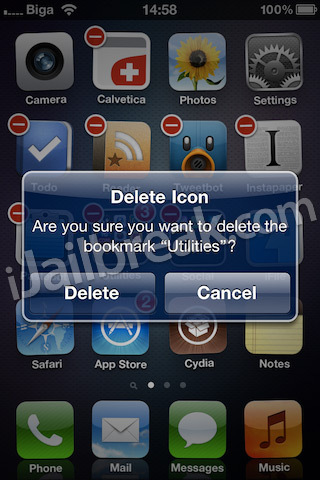 With a new tweak called UnFolder you can quickly delete folders without needing to manually remove each app inside the folder. This will be handy when you have many apps inside a folder, as you no longer need to manually drag each app out of the folder. A brilliantly simple tweak that solves a problem many users have experienced. Now you can delete folders at a fraction of the time it would of taken you to manually drag each app out of the folder. If you are interested in the UnFolder tweak you can find it through the ModMyi repo for FREE. Personally it is these simple tweaks that I really enjoy because they extend the functionality of your iDevice while still maintaining the default Apple iOS feel. About a month ago there was some widespread curiosity about how your iPhone/iPad is tracking your every move. With the introduction of the iOS 4.3.3 firmware Apple fixed many concerns people had with this location tracking issue. However, the fact that your iPhone/iPad is still tracking you has not changed. If your interested to see the extent that your iPhone/iPad is tracking you a new tweak has been released into Cydia called FootPrintz. You can use the tweak to map the location history your iPhone/iPad has already collected. You can either search for where you were on a given date, or when you were in a given area. You can also use the tweak to either manually clear out your history, email it to yourself, export it to a spreadsheet file, or even insert random data. No additional location information is collected by it. It simply shows you what your iPhone/iPad has logged. If you are interested in FootPrintz you can find it through the Cydia Store for a price of $0.99! all is well with it. save for the fact it always uses tri tone to alert for sms. wish this could be changed.